Each year from summer into fall, ornamental crape myrtle trees in the southern and central U.S. lay out a visual feast of vibrant flowers in purple, lavender, pink, red and white. But it is during the cold days of winter that the true feast begins. 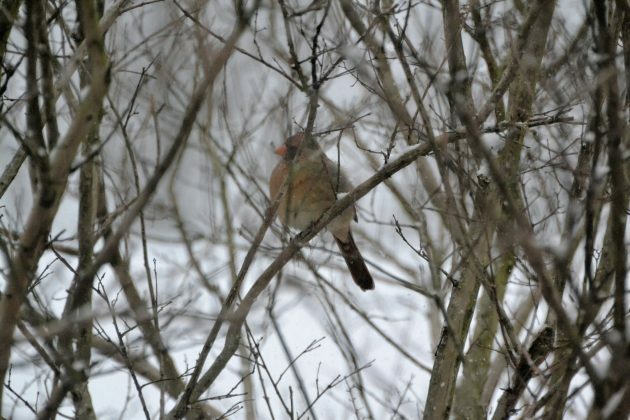 Goldfinches, dark-eyed juncos, house finches, cardinals, and house and white-throated sparrows visit the trees continually from early December through late February to devour the abundant seed crop that crape myrtles provide. It’s a recent adaptation that represents a dramatic shift in the diet of a significant number of native U.S. bird species to a non-native plant. Gary Graves, an ornithologist at the Smithsonian’s National Museum of Natural History, recently published a short paper on this subject in the scientific journal Southeastern Naturalist. Q: Why is this shift to a new food significant? Graves: Crape myrtles (Lagerstroemia) are from eastern Asia: China and Korea. There are no species of plants in the crape myrtle genus native to North America, but introduced Lagerstroemia have been planted in incredibly large numbers in the southeastern United States. People love their showy blossoms, attractive bark, cold- and drought-hardiness, and their ability to grow in a wide range of soil types. When so many native birds feed heavily on an introduced, non-native plant, it is important for ornithologists and ecologists to take note. The effect of invasive plant species on native plant and animal communities in North America and around the world is an important concern in conservation biology. Each year millions of crape myrtle trees are sold by nurseries in the United States. Many U.S. states also plant them extensively along interstate highways and other right of ways. They are also used widely in town landscaping all the way through the southeast. In Norfolk, Virginia; Charleston, South Carolina; and Savannah, Georgia, for example, you see crape myrtles everywhere. 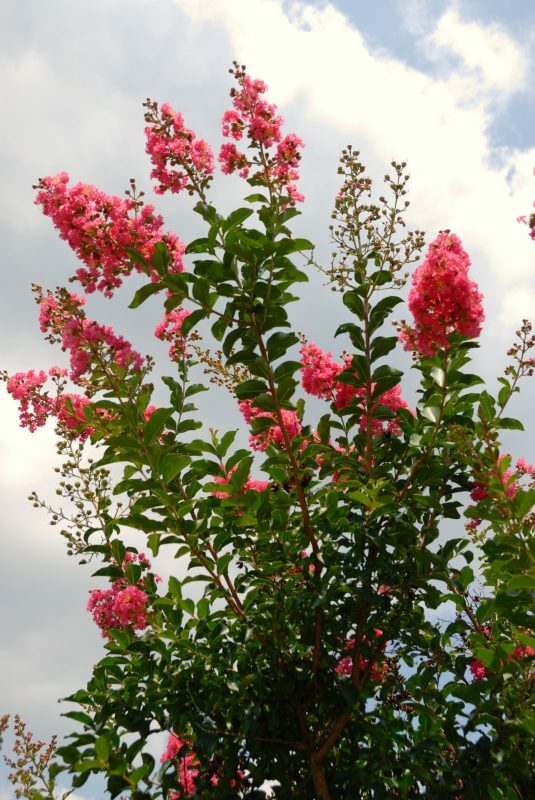 A large crape myrtle tree (20-feet tall) can produce a few pounds of seed each year. They produce brown ovoid capsules with six locules [cavities], each containing four winged seeds. 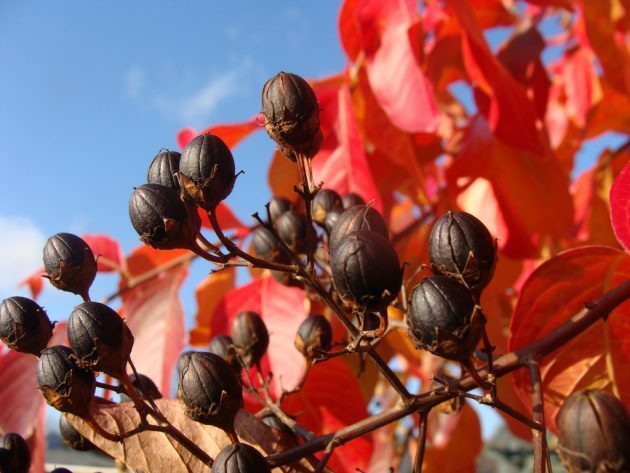 There are approximately 570,000 individual seeds in 1 kilogram [2.3 pounds] of crape myrtle seed. That’s a lot of seeds when you consider there are tens of millions of crape myrtle trees growing in the southeastern U.S. from Virginia to Texas. Q: What sparked your interest in this study? Graves: Years ago I noticed that certain species of birds were eating seeds from a large crape myrtle tree in front of my house in Northern Virginia. It is 20 feet tall and has tens of thousands of seedpods on it every year. I did a little background research, and despite the fact that these plants have been around for a long time in the U.S., I could find nothing in the scientific literature about the avian use of crape myrtle seed in North America. Over a period of several winters I began monitoring the assemblage of bird species that I saw extracting seeds from the crape myrtle in my yard. I didn’t know where it was going to lead when I started but it was very interesting. By late November after the capsules have dried out and the seeds are mature, certain birds start visiting crape myrtle. The seeds are quickly eaten and by late February there are few left. During this time I had thistle-seed and sunflower seed feeders set up in my yard a little more than 40 feet away so the birds had an alternate source of food, yet some species liked the crape myrtle seeds enough to go out of their way to get them. A pink crepe myrtle tree in Georgia. Q: How long ago were crape myrtles introduced to the U.S.? Graves: Crape myrtles were introduced to Charleston, South Carolina, between 1787 and 1796. It is one of the introduced plants at Mount Vernon, George Washington’s estate. They have been widely planted and naturalized across the Gulf Coast states since the 19th century. When confronted with an abundant new source of seeds from a brand new plant, some avian species adapted rapidly to this new winter forage. Of course they are able to exploit the seeds of many other plants during winter but they really key into crape myrtle. So our native birds have had more than a century to discover this novel food and learn to extract its winged seeds from the pods. Crepe myrtle seeds are spread by the wind and are inside a little winged casing that the birds have to break off before eating. Q: What bird species did you observe visiting crape myrtle the most? Graves: American goldfinches in particular seem to be uniquely preadapted to take advantage of crape myrtle seeds. They are very acrobatic seed predators and able to cling to the clusters of seed pods as they stick their little thin pointed bills into a dried pod, pick out a seed, crack off its winged casing and swallow the meat of the seed. A goldfinch weighs about 15 grams [.53 ounces], and one can subsist on these seeds if it has hundreds of them to eat each day. Goldfinches accounted for 49 percent of all birds I observed extracting seeds from my crape myrtle; dark-eyed juncos 21 percent, house finches 18 percent, northern cardinals 11 percent and white-throated sparrows and house sparrows 1 to 3 percent. Fallen seed was eaten frequently by cardinals, dark-eyed juncos and sparrows, but not goldfinches. Q: What surprised you about this study? Graves: It is a prime example of backyard natural history. You’d think that in this day and age that you couldn’t discover anything interesting or noteworthy in your own yard in a big urban area. And that’s completely wrong. The essential point is that crape myrtles are here to stay. There are absolutely hundreds of millions of these things grown in yards and gardens across the U.S. and many birds rely on them. My observational paper is an opening shot alerting other scientists and the public about this adaptation. 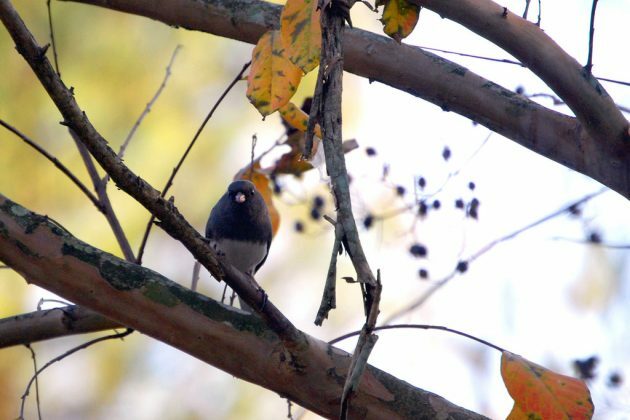 Future studies in other areas of the country will likely add additional species to the roster of native birds that eat crape myrtle seeds.